The Jaguar F-Type Coupe Is In America, Can You Find It? 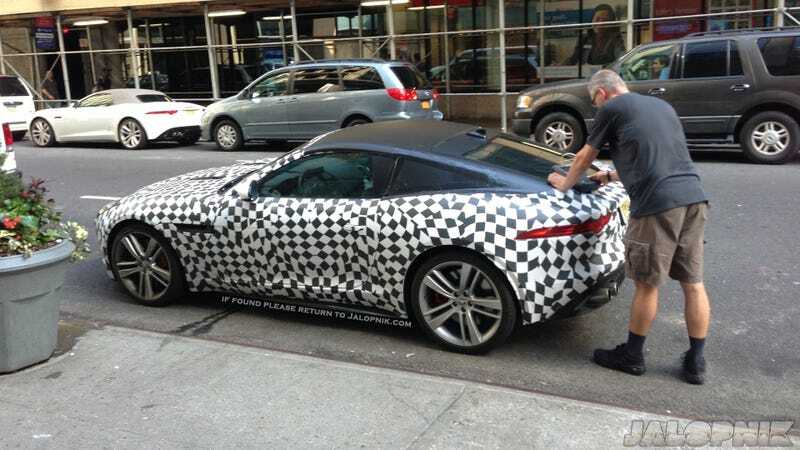 Two Jalopnik readers sent in pictures of a Jaguar F-Type Coupe on the streets of Manhattan. Can you find this prototype yourself? It's no secret that Jag is building a coupe version of its hot F-Type droptop, and prototypes have been prowling around the globe for months now. This could be the first prototype in the USA, though. Are Those F-Type Coupe Patent Drawings For The Car Or The Concept? Richard and John found this particular car yesterday in Midtown Manhattan (West 33rd, to be specific), surely testing out how the car will perform in real-world conditions of slowly driving past expensive boutiques trying to impress people. Can you find America's F-Type Coupe? Send us your photos at tips at Jalopnik dot com, or leave them in Kinja below.